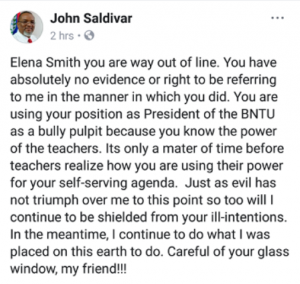 The new Minister of National Security, John Saldivar, has taken exception to his description by Belize National Teachers’ Union president Senator Elena Smith. Speaking with reporters on Tuesday, Smith said that Saldivar, like a teacher whose Standard Six students fail the Primary School Examination had done poorly and had presided over the most murderous year on record in 2012. His previous association with accused murderer and alleged con artist William “Danny” Mason doesn’t help matters. Smith concluded that “you can’t put di rat fi mind the cheese.” Saldivar struck back on Facebook, accusing Smith of using her position as a bully pulpit because of the power of the teachers. 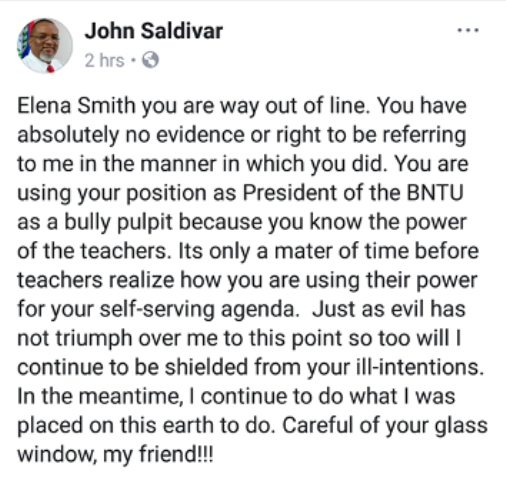 Having acknowledged that power, Saldivar goes on to say that soon teachers will recognize that Smith is using them for what he calls a “self-serving” agenda, and that he will be protected from her “ill intentions.” Finally, after stating that she had no evidence for her assertions, Saldivar warns, “Careful of your glass window, my friend!” The two may meet face to face in Belmopan on Thursday when Smith and the B.N.T.U. rally a few feet away from the National Assembly. We will never even get close to controlling our crime as long as we have career bureaucrats/politician who have no experience or knowledge of the subject that they are chosen to administrate.